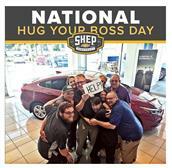 From the moment you step into our dealership until the time you drive away, your positive buying, trading and service experiences with Shep Chevrolet are our number one priority. We encourage you to use the expertise and resources of our staff; they are here to help and assist you in any of your automotive needs. Call us today at 800-468-3650 to let us know how we can help!